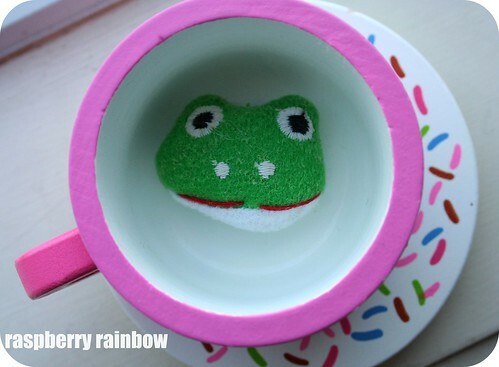 Raspberry Rainbow: Frog head tea, anyone? Would you like a cup of frog head tea? I am not sure if this was one of Abbey or Zoe's creations. I had to take a photo as it looked so colourful and almost drinkable. We are actually in Hong Kong at the moment for the school holidays. It is lovely to be together as a family again, not just for a whirlwind weekend. The weather at this time of year is gorgeous, between 21-27 C most days and not too humid - yet. Interestingly, Hong Kong has an ozone layer. I can feel the ozone layer working. It is such an amazing feeling, the sun on your skin, but not feel like you are burning instantly. We are still wearing sun screen, it is such a habit to always apply it when you come from Australia. It is a good habit to have, I know. Have a lovely weekend. Enjoy your tea, with our without frog heads. Oh Cat, this mug is so cute! Enjoy your time together as a family. I know you've heard it a million times before, but you will all be together for much longer soon. And that ozone layer... yes, we are in some good habits in Australia (by necessity) really! That frog is friendly better than one that comes down the pipes when the dam or tank has dried up. Memories from my childhood. Sounds like some exciting adventures and wonderful memories are coming your way, enjoy your trip!